Name Help: First Baby, No Clue! My boyfriend and I are expecting our first child in a few weeks. It is a complete surprise, and while we’re happy about it, I feel behind on EVERYTHING. That’s probably because I’m a planner, and this pregnancy has messed with all of my ideas about what it would be like … someday. 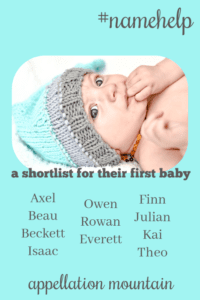 I have a list of names I like: Isaac, Owen, Rowan, Axel, Beckett, Beau, and a few others. He doesn’t seem to have much of an opinion about it, and no name stands out as better than the rest. In fact, this list is today’s list. It was different a month ago, and could change completely again. His only request is that we use his grandfather’s name, Patrick, as our son’s middle name. We won’t get married until summer, but the baby will have his last name, which sounds almost like Lawrence, but is spelled differently. Please read on for my response and leave your thoughtful suggestions in the comments. A new baby, a new husband – it’s a lot! No wonder you’ve got decision fatigue when it comes to choosing a name. It’s not unusual for one partner to be far more interested in names than the other. And while I don’t like to stereotype, very often it works like this: the mom-to-be suggests. The dad vetoes. Or maybe shrugs noncommittally. And as a planner, I feel your pain. My husband sometimes shrugs off decisions that I’m mulling over because they’re too far in the future for him to feel any urgency. But it doesn’t change the fact that they’re occupying space in my brain now. So instead of talking about names, could you talk about strategies? I’m convinced that one of the reasons picking names is tough is that there’s no framework. When we rent an apartment or buy a house, there are things to consider: price, neighborhood, distance to work or school, and so on. But a name lacks those objective measures. Nancy’s Baby Names has some great tools that might help. Or maybe a spreadsheet isn’t the answer. Would your boyfriend agree to something like this? He picks three (or two) names he can live with from your long list, and you choose the final. OR you pick three (or two) and he decides on the final. You make a long list of names you’re both willing to consider, then rank them independently. When you’re finished, look to see where there’s overlap. Now, back to your current list. I’d rule out Isaac, because Isaac Patrick is I.P. I don’t believe in worrying overmuch about teasing potential, but that one strikes me as awkward. Owen, Rowan, Axel, and Beckett work fine, though I’m not wild about any of them with Patrick Lawrence. I’d say that Beau Patrick Lawrence is my favorite. Everett – Just like Beckett, but I think that extra syllable in Everett sounds better with Patrick Lawrence. Finn – Is Finn Patrick too Irish? I don’t hear Finn as shamrock green these days – it strikes me as modern and nicely Americana. Julian – Close to Owen and Rowan, but again, adding an extra syllable might increase the name’s overall appeal. Kai – It reminds me of Beau, but while Beau leans slightly Southern, Kai feels more international. Nothing wrong with either style, just another option to consider. Theo – You seem drawn to the long ‘o’ sound in Owen and Rowan and Beau. Would you consider an -o ending name? Leo, Milo, and Arlo all have a strong ‘l’ sound that might conflict with Lawrence, but Theo could be perfect. I could go on … and on! 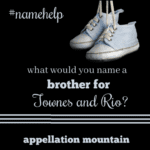 But I’m curious to hear what others have to say, both about names and about how to encourage reluctant partners to engage in the naming process! Readers, what would you suggest to Jess? And how did you handle a partner who wasn’t into naming the baby? I LOVE Owen Patrick Lawrence!!! That’d by far be my first choice. It sounds so friendly, lovely, and handsome. Beau is great, too. I like the suggestions of Everett and Theo as well! I like the alliteration of Leo Lawrence, but I know that’s not for everyone. 🙂 Patrick as the first sounds really nice, too. And Isaac wouldn’t bother me, especially since P is the middle initial – but I know that’s a subjective thing. I don’t mind most initial problems. I would also suggest Charles. Charles Patrick Lawrence is classic, sturdy, handsome. And Charlie is friendly and fun and feels like it has a similar vibe to most of the names on your list. But I actually think Charles nicknamed Huck would be better for you guys. Charles Patrick Lawrence, Huck Lawrence – it feels perfect to me. Congratulations on your new love and best of luck finding the perfect name for him! I really like Owen Patrick Lawrence! Owen seems friendly and I like the repeating sounds in Owen Lawrence–they tie his name together. Axel Patrick and Beckett Patrick are harder to say with the repeating x/k sounds, so I’d consider dropping those. You might like Fraser Patrick Lawrence. I’m not sure I “handled” my partner who was reluctant to engage in the naming process early on. He really doesn’t feel inclined to talk about it until the last month or two of each pregnancy. One trick I did find that helped, especially in the second pregnancy, was raising the topic when we were hanging out with friends–they could make suggestions we might not have thought of, comment on our current considerations, and my husband was more likely to participate because it was friendly banter and not me cajoling (nagging) him. I also wouldn’t worry to much about your partner not overly involved in the naming process you guys have a lot on your plate plus he has given a middle name. I think finding a few names you feel strongly about would be a great start, then see what he thinks. Names he doesn’t outright veto should help build a contender list. What about Patrick as a first? I used it in the middle for my son and sometimes regret not using it in first spot. I actually think most of your list is fine with your surname. Going off Rowan do you like Reed? Reed Patrick Lawrence sounds great. Only strategy that worked for us was for me to go through a list, mark any that were ok and then read that to hubby. He would veto most and I would keep a running list of the rest. Over time I would re-present names previously vetoed that I really liked and take out names I decided I didn’t like after all. Eventually the list got shorter and more targeted and we would choose from there. After the first child I declared biblical names or major saints only which reduced my stress over the size of the task. I know a family that only used nature names which had the same effect. It becomes a situation of choosing your favourite from finite options rather than choosing the ‘best’ name in the universe which is a lot of pressure. I like Beau, Beckett/Beck, Finn (or Finnegan, nn Finn), Theo or Everett best. I could also see Jude, Grady or Tobin. I agree with Abby on needing a strategy. You have some great names already. They work with your last name, and are easy to spell. 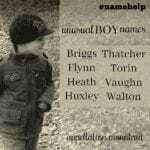 Choosing a name doesn’t seem to be the issue but the symptom. 4) Next Sunday add any that got two yeses to the master yes list, one yes and one maybe goes on the maybe list. Trash any nos. After a few weeks, rank the yes list into two tiers with your groom-to-be. Put tier one on the fridge or bathroom mirror so you can both mull them over when brushing teeth, prepping dinner, taking a shower. This is when I find that I realize I love (or don’t love) a name…. after literally living with it for a while. 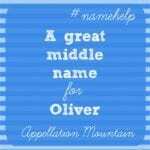 There are so many awesome names but only a few that feel like **my** child. 4) If you want to add a new name to the yes list on the fridge/mirror, one of the others has to go. This list shrinks, it does not grow. 5) My recommendation is to have the name picked before the birth because some newborns look odd and could look completely different in a netter of days. But I know plenty of people who think the opposite. Both do work. No one is called Baby (Last name) forever. Of course, I can’t help but suggest two names. — Felix. It means happy and boy what a happy 2019 you have ahead of you! Felix Patrick Lawrence. — Asher. It means “fortunate, blessed, happy one.”. Again. What could be more perfect? Asher Patrick Lawrence. Best wishes for a magical 2019! 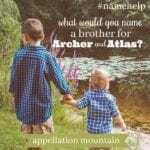 Is your surname one that could be used as a first name? Or even a part of it? Jones Patrick Lawrence, William(s) Patrick Lawrence, John(son) Patrick Lawrence, etc. How about any family members from your side of the family? Your dad’s middle name? Your mom’s maiden name? Where did you and your son’s father meet? Would that make a suitable name? Best wishes on your son and your marriage! I love the idea of the narrowing options Abby suggested. That could make it more fun to arrive at a final selection, maybe especially with a reluctant naming partner! The suggestion of Hugh made me think of Hugo. Or if you’re more daring, want to stick with the long O sound, and like alliteration, how about Laszlo? Congratulations! My husband is the same way with names lol. The system that has seen us through two babies is I create a list of first and middle combos, present it to my husband and let him whittle it down from there. So far I just pick a first name I love add an honor name from our family in the middle and we go from there Try not to stress too much. Your current list sounds great and you’ll love whatever name you pick once it’s attached to a baby. Beau, Finn and Theo are some of my faves with Patrick from this post. I absolutely love Beau Patrick and Theo Patrick! Some of my other favorites that I think sound wonderful with Patrick “Lawrence” are Aaron, Bennett, Gabriel, Hugh, Leo, Raymond and Sam. A strategy my husband and I used at name time, which we ending up having a lot of fun with and asked some of our family members to do with us, was fill out brackets. 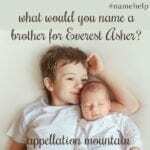 I paired 24 names, I think, that I loved (and I knew my husband didn’t hate) and let everybody help whittle them down from there. Best of everything to you!